Andy Allsopp, who is taking part in Man v Fat football league - a football competition in Solihull for men with a BMI of over 30. Photo courtesy of Newsteam/SWNS. A Warwick paramedic has become a star striker for a new weight loss campaign aimed at men like him who are medically obese. Andy Allsopp, 29, joined the first Man v Fat six-a-side football league in January - and having previously spoken out about being assaulted while working for West Midlands Ambulance Service - put himself forward to be a spokesman for the scheme. He has since showcased the scheme on BBC Coventry and Warwickshire Radio, BBC West Midlands Radio, BBC Radio 5 Live with presenter Adrian Chiles, Midlands Today and is due to appear on The One Show. 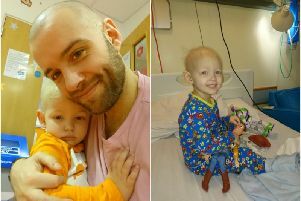 Mr Allsopp, whose son Harry was born last year, said: “I want to be able to be around for as long as possible and to play football in the park with him and being healthy will help towards that. “I was starting to feel tired and it was really getting me down but becoming a dad gives you that added sense of responsibility for yourself and others. The league, which is held at Leisure Leagues in Solihull, is made up of eight squads of ten players, all of whom started with a body mass index (BMI) of 30 or over - which is classed as being obese. While games are played as normal, players can also ‘score goals’ for their team by losing weight each week and reporting their results before kick-off - which will give them an advantage in a game. Players can also use an online forum to follow advice on how to eat healthily. Mr Allsopp said that after just a few weeks the league is already having an effect with players losing a total of 24 stone in just a fortnight. Mr Allsopp said: “If you don’t lose weight it’s like scoring an own goal. “I’ve tried Slimming World and Weight Watchers but it seemed like it was 95 per cent women at those. But here these guys are all like me and I look forward to going along and playing on a Monday. Mr Allsopp believes the Man v Fat football leagues will soon become a national scheme. The weight loss scheme has been commissioned by Solihull Borough Council.